Jane Hayes has a problem. She suffers from a severe case of Austenmania, and I mean mania. Her bedroom, littered with porcelain teacups, stuffed dolls, and a life-size cardboard cutout of Colin Firth in Darcy regalia, looks like a 5th-grader’s shrine to Pride and Prejudice. That this woman managed to go on dates boggles the mind. So it comes as no surprise that when Jane sees a commercial for Austenland, a themed British estate with period actors that promises romance with an Austen-type hero, she cashes in her life savings and flies her sad, sad self off to England. Hayes gets a rude awakening on her arrival. The “bronze” package she bought — the cheapest available — seems reserved for Mansfield Park’s Fanny Price. The management snubs her, gives her drab gowns, a tiny bedroom on the top floor, and excludes her from fun activities. To make matters worse, the Darcy-type period actor, Mr. Henry Nobley, is in the extreme pre-Elizabeth Bennet stage. Mr. Henry Nobley (J.J. Feild) looking haughty. Luckily, Jane can vent her frustrations with Martin, the handsome stable hand. Their relationship develops quickly — a little too quickly. One minute he’s pitching hay in the barn and the next they’re making out to the strains of a cheesy 80’s pop song. None of the other relationships evolve smoothly, either. Character development in this film sacrificed itself on the altar of time in favor of farcical scenarios. I found myself thinking, “When did that happen? And why?” I assume Jerusha Hess’s book, on which the film is based, elaborates more on this and Jane’s troubled romantic past, which is mentioned but never explained. 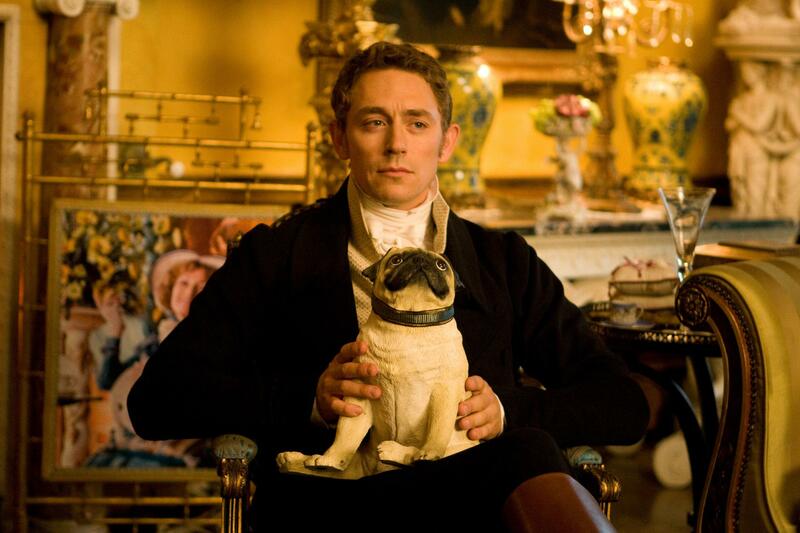 Austenland tries too hard, but isn’t completely lacking in charm. That’s largely due to the cast, who strove to make this a watchable film. In the end, the plot good-naturedly pokes fun at “Janeites,” only to fall short of its potential and succumb to Hollywood rom-com predictability. If you enjoyed the 1995 Pride and Prejudice miniseries, though, you may find the film’s occasional nods amusing, as I did. Also if you’re a fan of Nelly. And that’s all I’m saying. Beaver couldn’t make it to the showing, sadly, so I’m rating it by myself: 2 carrot sticks (out of five).